The Mighty Thor finally gets his own design, joining Iron Man and Captain America among Avengers heroes featured here. This design is a mix of the comic and film interpretations, and features a red back panel to mimic a cape. No plans to make this available currently. And if it did become available, methinks all those plates on the front would be sublimated. Embroidery would make the jersey too heavy and cost-prohibitive. 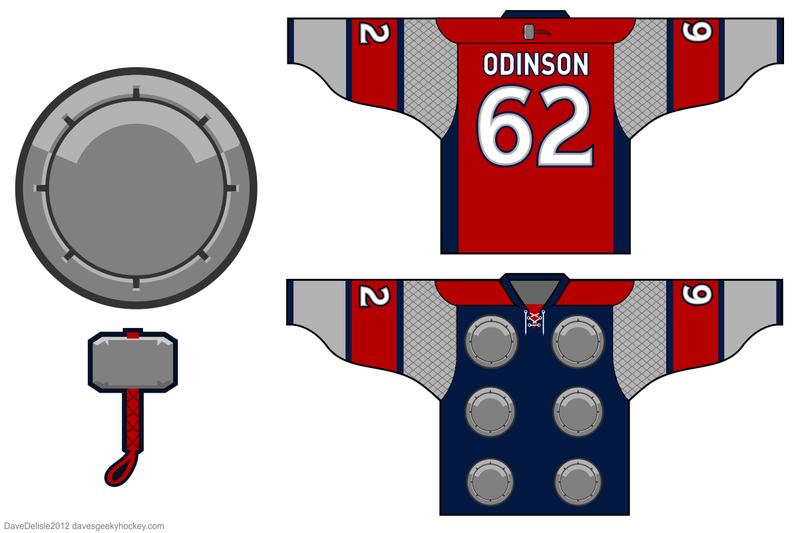 Posted on October 26, 2012, in Geeky Jerseys, Hockey Jersey Design and tagged Avengers, davesgeekyhockey, Geeky Hockey Jerseys, Hockey Jersey Design, THOR. Bookmark the permalink. 5 Comments. Heck, you could even throw Beta Ray Bill on the back of there. Would be a bit of a squeeze, but yeah totally. I’d love for this to come out so I can snag one. Then later a Hulk one can come out and you can have all the Avengers in jersey form.